“Girl Crush,” written by Hillary Lindsey, Lori McKenna and Liz Rose, won two CMA Awards (Single of the Year and Song of the Year), was nominated for Grammy Song of the Year and earned the distinction of Grammy Best Country Song. The group also took home a Grammy for Best Country Duo/Group Performance for the record-breaking tune. 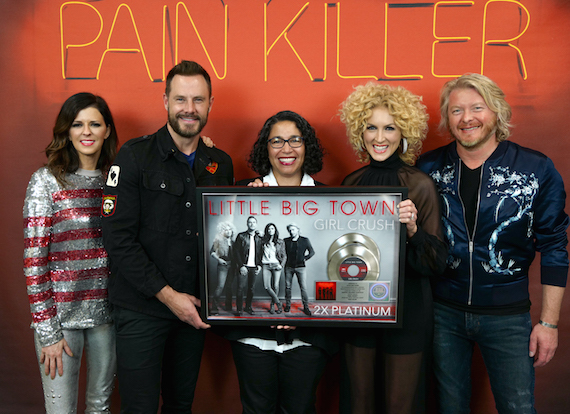 “Girl Crush,” the second single off Little Big Town’s gold-selling sixth studio album Pain Killer (Capitol Records Nashville), remained at No. 1 on the Billboard Hot Country Songs chart for 13 consecutive weeks, setting the longest run in the top spot for a group since 1959.